The Indian phase of the joint air force exercises will be held in the Halwara air station. The first phase was held in Russia in August. The India phase of the Avia Indra-2014 joint air force exercises between Russia and India will be held in the Halwara air station in Punjab between November 17 and 27, the Deccan Herald reported, citing sources. The Russian personnel will use Su-30MKI fighter aircraft and Mi-17 and Mi-35 helicopters, the paper said. The Russian wing of the exercises was held in August in Voronezh at the Pogonovo range and in Astrakhan Region at the Ashuluk training range. During the first phase, the joint Russian-Indian crew flew the Mi-35 and Mi-8, as well as the Su-30 CM. Helicopters brought down several thousands of litres of water to the firing ground, practicing fire-fighting, and the fighters hit the ground targets with missiles and bombs. Pilots from mixed crews communicated with each other in English, and using sign language. Indian Air Force commanders expressed interest in the Russian surface-to-air missile systems used during the Russian wing of Avia Indra-2014. “They have expressed great interest in our systems, they probably need to modernize their weapons arsenal,” Maj. Gen. Babakov, head of the Russian Air Force's anti-aircraft missile troops, said in September. India is particularly interested in Russia’s S-400 (SA-21 Growler), S-300PM (SA-10d/e), Pantsir-S1 (SA-22 Greyhound) and BUK surface-to-air missile systems, according to Maj. Gen. Babakov. In July, Russia and India conducted the naval version of Indra-2014 in the Sea of Japan. The army wing of the exercises was held in September-October at the Prudboy training range in the Volgograd region. Military personnel from both countries held urban anti-terror exercises. They worked out joint actions for protecting important state facilities, accompanying convoys, and the neutralization of illegal armed formations. Indian armed forces used Russian anti-tank rocket launchers, Kalashnikov guns and Dragunov SVD sniper rifles. 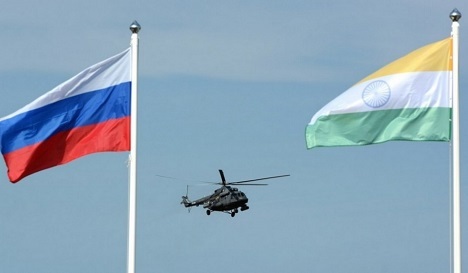 Since 2003, India and Russia have conducted 11 large exercises under the Indra series. While the drills were initially meant to be held once in two years, the format has been expanded the air forces were included this year.